FAQ - JNP MANniu Water Tec Ltd.
How do you distinguish good quick fittings? 1. PP quick fittings are the best choice, as PP is a non-toxic food-grade material. It is also more pliable, and more resistant to acid/alkali, aging and embrittlement. 2. You can inserted a tube into the quick fitting and pull it out.A good fitting should have a two-step feel when you remove the tube. 3. A threaded quick fitting can be tested with an international standard guage for precision. 4. It's best to have SUS#316 stainless steel collets, which can secure the tubing more firmly. 5. You can test the fittings against international standards to see if there is leakage. 6. It is recommended to use quick fittings and tubing from the same manufacturer. What is the difference between PP and POM quick fittings? PP: Non-toxic food grade, high pliability, and acid/alkali resistance, but it is more difficult to process and requires good manufacturing capabilities. POM: High hardness for easy shaping, but it is more brittle and less resistant to aging. 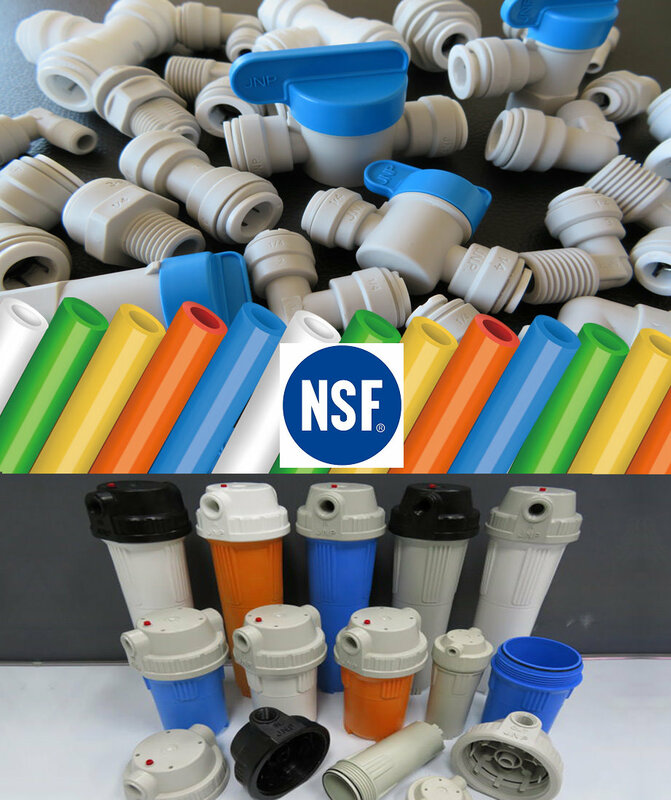 How are JNP quick fittings different from other major brands? We offer both precision tubing and PP quick fittings, which are fully compatible. Tubess account for a very small part of water purifier cost; but once there is a leakage, even the best machine will become a secondary product! That would be penny-wise and pound-foolish. What is so special about tubes used in a water purifier? There are numerous choices of water pipes on the market, but quality varies greatly. Pipes of better quality are called tubing, and only those with a certain degree of precision can be called precision tubing. Common tubes are of inconsistent quality and easier to have leakage and aging problems. Production of precision tubing requires good and stable technology to ensure no leakage, precision roundness, high resistance to aging and burst pressure, uniform thickness and smooth surface. What is the recommended hardness for the tubing? The tubing should not be too hard or too soft. Too hard, the tube will be difficult to handle, and too soft it may bend and rupture easily and cause leakage. You can cut a section of different tubes and compare their hardness. Will a slightly bigger tube have less leakage problems? This is not a recommended approach. A tube in the upper limit of the tolerance may cause the sealing O-ring in the quick fitting to fatigue over time. It is best to choose the median size. How is JNP filter housing different from other brands? Is whole-house water purification system really necessary? Common filters only address drinking water and protect you against 1/3 of daily water pollution. The remaining 2/3 of the water pollutants come primarily from baths and showers (chlorine) and water used for cooking. These pose serious health risks too. With increasingly pollution, good water for the whole family -- from drinking, washing, to cooking -- is of the utmost importance! Products from many manufacturers are of poor quality, why?